avast! Mobile Security quiz winners! AVAST recently surpassed a major milestone: More than 100 million downloads of avast! Mobile Security & Antivirus for Android. To celebrate the phenomenal popularity of avast! 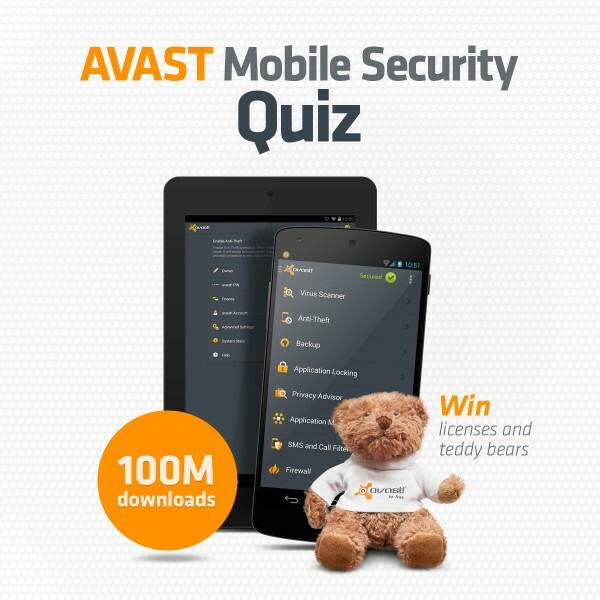 Mobile Security, we organized a test-your-knowledge quiz on our popular avast! Facebook page. Our goal was not only to test your knowledge and award participants, but also bring your attention to and educate users about mobile security. Our knowledge quiz wasn't easy, but we made sure that you received a hint to answer the questions correctly. Thousands of you submitted answers to our 5 questions as well as shared your thoughts about what the greatest threat to mobile security is today. How many Smartphones are lost or stolen every minute of every day? The correct answer was 100! The answer was found in this blog post. avast! Anti-theft helps you locate your lost or stolen mobile device. There are various methods used. Which of following is NOT one of the methods? The correct answer was 'Communicate via your GPS device.' The hint was hidden in this blog post. Based on users’ answers in an AVAST survey, which group of people are more vulnerable to mobile malware? The correct answer was 'Males.' The answer was found in this infographic. When was the first version of avast! Mobile Security released? The correct answer was 'December 2011.' The hint was hidden in this YouTube video. The AVAST team demonstrated our Mobile Security product at one of the largest mobile conferences in the world. In which great city did it take place? The correct answer was 'Barcelona.' The hint was hidden in the following blog post. Now check your mailbox and search for the email from us. It will contain a special voucher with instructions on how to activate your Premium license. It might end up in the Junk/Spam folder, so please make sure you double check it too. In the following blog post we will announce winners of our VIP #AVASTteddy and the lifetime license, so please stay tuned!